The rebound in Chinese coal consumption, after a 3-year drop, strongly drove this trend. Our preliminary estimates based on monthly data for key countries indicate a trend reversal in global energy-related CO2 emissions: they grew in 2017, after having stabilized since 2014. Hereunder are the key learnings of this analysis. The CO2 emissions growth in 2017 (estimated to around +2%) can be attributed to higher coal consumption. 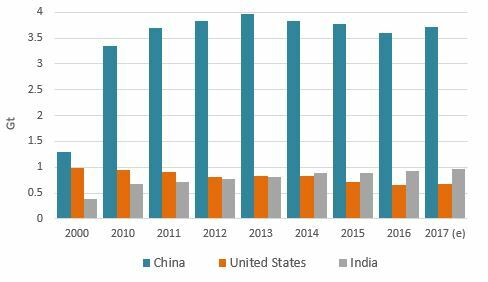 Global coal consumption is estimated to have increased noticeably in 2017 due to a rebound in China (+3.7%), steady growth in India (nearly +4%) and stabilization in the United States (+1%) after a 3-year decline (-20% between 2013 and 2016). In China, sustained economic growth (around +6% in 2017), growing electricity consumption (nearly +7% in 2017 vs. +5% in 2016) and relaxed coal production restrictions contributed to a 3.7% growth in coal consumption - after a 3-year decline. According to customs data, coal imports rose by 6% in 2017 to a 3-year high, after coal import restrictions were eased in July 2017. Coal consumption growth remained steady in India (around +4% in 2016 and 2017), supported by a 4% growth in domestic production. In the United States, higher domestic gas prices contributed to a slight increase of the use of coal for power generation. The Chinese power sector remained strongly dependent on coal, despite surging renewable capacities and the implementation of a national coal-to-gas conversion policy. However, Chinese gas consumption has increased rapidly, with total natural gas imports (pipeline and LNG) growing 35% and LNG imports surging by nearly 50% in 2017, overtaking the United States as the third largest gas importer behind Japan and Germany. In Russia, gas consumption rose after 4 years of decline, as the country’s economy has recovered. In contrast, gas consumption contracted by about 3% in the United States. This decline in the US, the first after seven years of uninterrupted growth, mainly reflects a warm winter weather and a lower electric power sector use (lower electricity generation, increased competition from renewables - around 16% of the power mix in 2017, and cheap coal). Increasing electricity consumption growth in China (+6.6% in 2017, vs. +5.5% in 2016) - driven by the strong industrial demand and despite large energy efficiency improvements -, and in other large economies, such as Canada, Brazil or Russia. 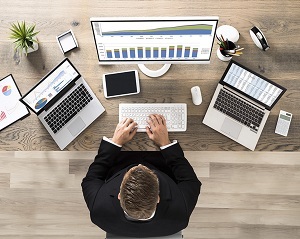 On the other hand, electricity demand continues to slightly decrease in the United States and in the European Union, as a result of energy efficiency improvements. Oil consumption continued to grow in China by nearly 6% in 2017 (nearly +30% since 2012), as in India (over +2%) with the development of the vehicle fleet. 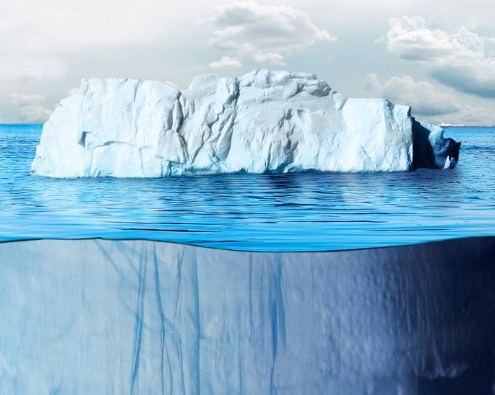 The positive trends pursued in the United States (+1%) and in the European Union, confirming the trend reversal initiated over the recent past years. Our 2017 preliminary estimates are available in our Global Energy and CO2 Data information service. If you are interested to access the data, please contact us at research@enerdata.net. 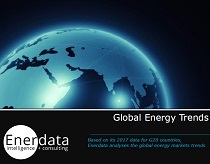 As every year, Enerdata’s detailed ‘‘Global Energy Trends’’ will be published in May, with all details per country and per energy.